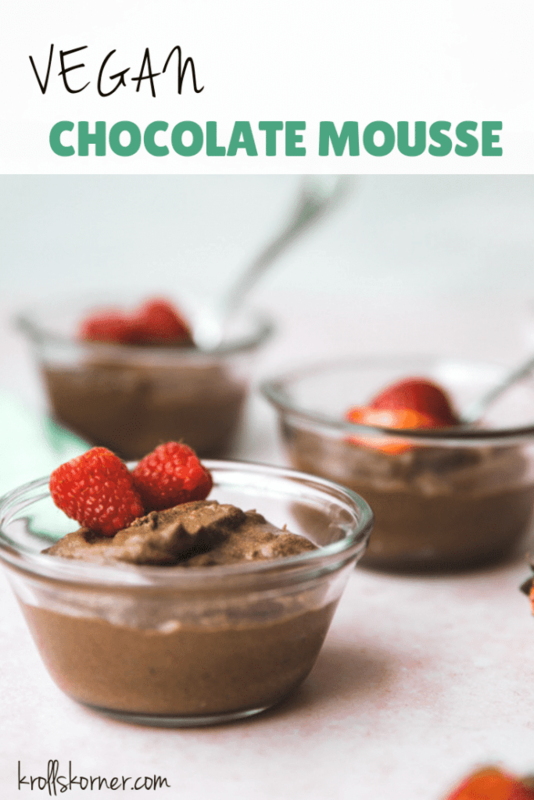 Vegan Chocolate Mousse is made in the blender or food processor and contains only a few simple ingredients! 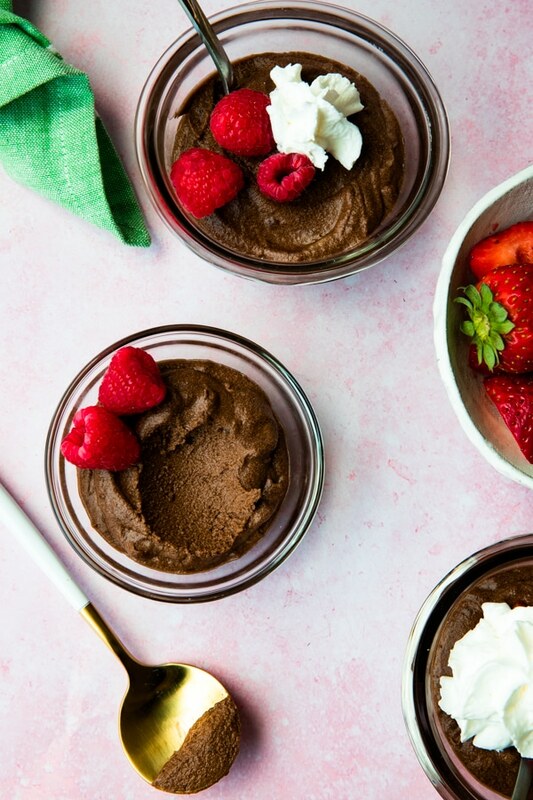 Vegan Mousse will be your new favorite dessert! With Valentines Day only 14 days away this will be an easy, healthy and delicious dessert to enjoy with your significant. Chocolate candy is nice and all, but a homemade decadent chocolate mousse sweetened with dates can really impress the one you love! 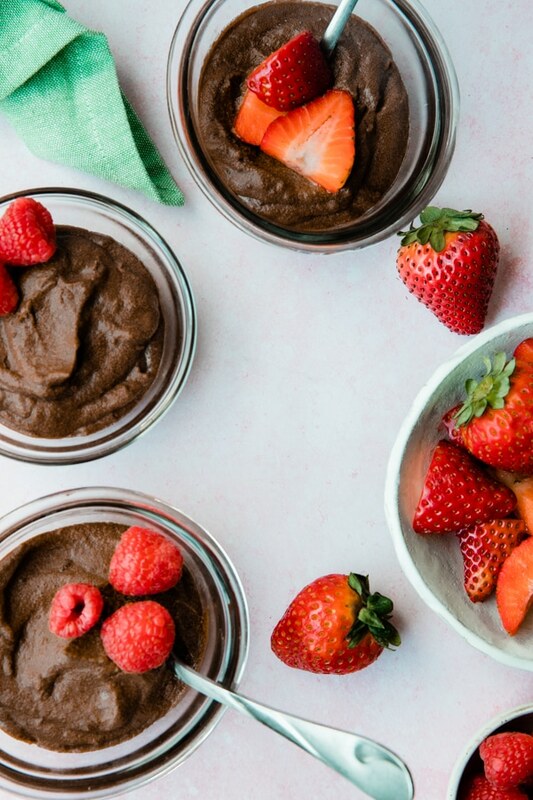 This Vegan Chocolate Mousse is simply fabulous. The best part of this vegan mousse? You blend everything in a powerful blender, put it in the fridge for a few hours, and that’s it! Top with fresh berries and coconut whip cream and dessert is ready. They are high in potassium, magnesium, fiber and antioxidants. Some studies have shown dates may promote and ease natural labor for pregnant women when consumed during the last few weeks of pregnancy! Dates are an excellent natural sweetener. For example if a recipe calls for 1 cup of sugar you can sub it with 1 cup of date paste. Canned, unsweetened coconut milk. 13.5 oz. Once you buy the can at the grocery store, place it in your refrigerator (upside down, or open the can upside down!) so the milk can harden. (At least 3 hours or overnight). When you open the can, about half of the can will be the hardened coconut milk, and the liquid coconut milk left can be discarded or used for another culinary purpose. But wait….what is the difference between pudding and mousse? Both are smooth and creamy, so what sets them apart? Pudding is traditionally made with a mixture of milk and sugar, that’s cooked and thickened with cornstarch. Mousse starts with a base similar to pudding, minus the cornstarch, to which beaten cream or beaten egg whites are folded in. Instead of cream or egg whites, we used the coconut milk to make it healthier. You can also use avocado! How they are different: They different on how the pudding and mousse is thickened and their textures. Pudding is semisolid and more dense, while mousse has a lighter, airier texture. On another note, I am feeling so good about 2019! As we head into February I am feeling thankful and blessed to be where I am and doing what I am doing, all with your support. So, grab a spoon, and dig into the new month with me. New possibilities, new opportunities…and new ways to enjoy chocolate mousse! 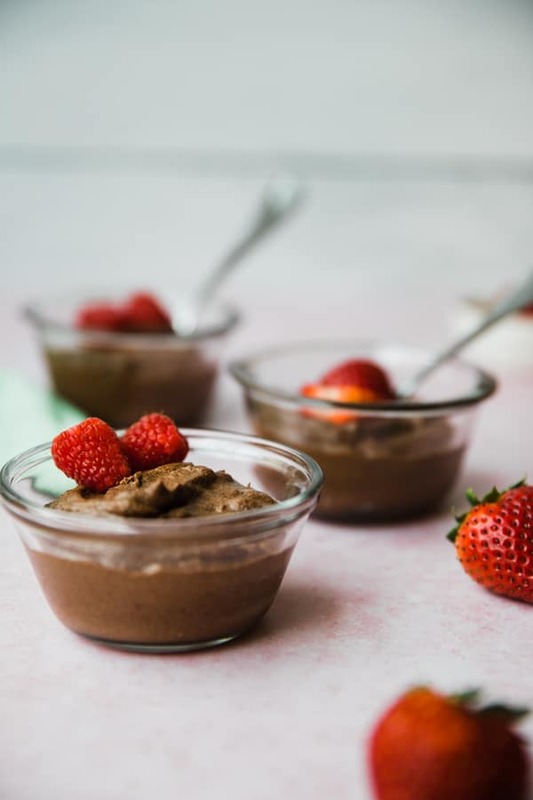 Vegan Chocolate Mousse is made with coconut milk and it is creamy, smooth and delicious topped with fresh berries! First, you will need to put your canned coconut milk in the fridge for 3 hours or overnight for the coconut milk to solidify. Then, you can use the solid coconut milk contents for the mousse and discard the remaining liquid in the can (or save it for another culinary use). In a powerful blender or food processor, you will blend your dates, solidified coconut milk and water together. Then, in a microwave safe bowl melt the chocolate chips and coconut oil together. I cover with a paper plate and heat for 1 minute, stir, and then heat for another 30 seconds. It should be melted at this point! Add in the melted chocolate and cocoa powder into the blender and mix until smooth. Pour the smooth mousse into individual serving dishes and place in fridge for at least 3 hours. Enjoy with fresh berries! LOVE THIS RECIPE? 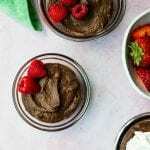 PIN THIS VEGAN CHOCOLATE MOUSSE FOR LATER!